BMW's DriveNow service allows Londoners to pick up a choice of BMW and MINI cars, including the T3 Award-winning, all-electric BMW i3. We tried it out, and almost immediately got involved in a crash, but up to that point we were highly impressed. The DriveNow service is available in the north east of London only so far, on the areas covered by this map. There are 270 cars in total, including BMW 1 Series and Mini Countrymans (Countrymen?) and the big prize, 30 BMW i3 electric cars. You register here - there's a £29 fee - and download the app, which is for iOS only, here. The app's key functionality - unlocking the cars - also works on Apple Watch. The killer feature of DriveNow is that you can leave the cars anywhere you want, within the above zone. Well okay, you can't leave them blocking a junction, but you can freely deposit them in any parking space, gratis. We found registration straightforward, apart from the fact that it took three attempts to upload our documents. It also took a day or so for the driving history to start appearing. With the likes of Zipcar well established, this kind of on-street, smart car-hiring service is not new but BMW has innovated by adding features such as having a fuel guage on the app, and also an easy filtering system to find the type of car you're after. The app's sidebar is overly busy with options and could do with some reorganisation, and it's not very clear that you can use the app to call customer services, especially when you are, for instance, in a panicked mindset after an accident. Now, to be fair, we only discovered this because, upon settling into our BMW i3, having opened it via the app, we set off and were almost immediately involved in a minor shunt that we swear is not our fault. We eventually managed to contact customer services via the car's onboard computer, and they were very helpful. 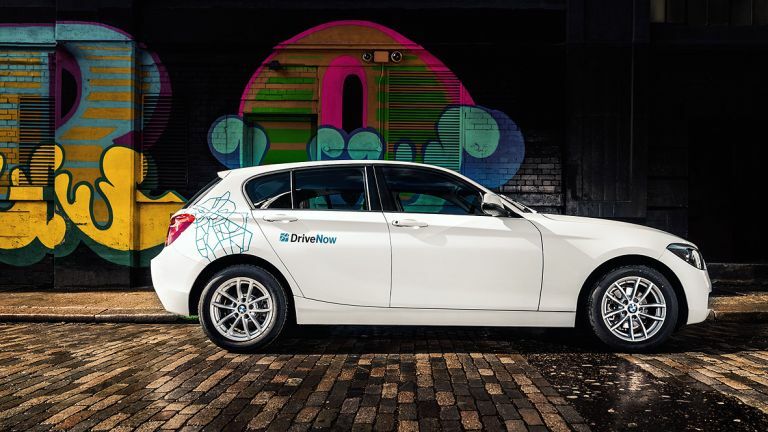 DriveNow is a joint venture between BMW and rental company Sixt SE, with Vodafone providing the communications infrastructure in London. It operates in eight cities around the world as well as London: Berlin, Hamburg, Munich, Cologne, Dusseldorf, San Francisco, Vienna, Copenhagen and Norwich. No okay, not Norwich. The nature of DriveNow is such that you don't have to pay for tax or fuel, and insurance is also included. Although to quite what extent the insurance covers you, we'll have to let you know once this thing works itself out. Other costs are 39p per minute when driving, 19p per minute when parked up without having ended the hire period, and you do have to cough up for London's much-loved congestion zone (£11.50 during peak hours), if you enter it. Unless, that is, you're in an i3, because that, as a non-polluting EV, is exempt.